The NHLPA and CBC’s Hockey Night in Canada are teaming up to donate hockey equipment to grassroots programs around the world. The NHLPA’s Goals & Dreams fund is celebrating its 10th anniversary by going on a 10-country tour in 10 days, donating around $125,000 US worth of equipment to cities across the globe. Reaching the top echelons of professional sports can bring in plenty of money, but more importantly, it brings a wealth of opportunity. 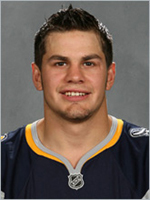 For the Buffalo Sabres’ Patrick Kaleta, a local boy, it was his chance to start the HITS Foundation. HITS is an acronym for Helping Individuals To Smile. The organization is so new that it doesn’t have a Web site yet. So for now, it’s public voice comes from the Buffalo News’ John Vogl. The Boston Bruins are shaving their heads for charity, while the Carolina Hurricanes are growing beards for charity. Considering geography, you would think it would be other way around, but if it’s for charity… Also, the NHL announced its charity component to its annual awards event in Vegas. 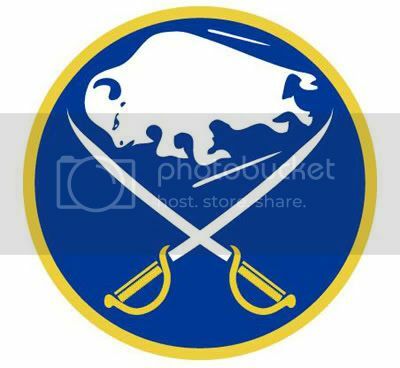 WGRZ-NBC reported that Buffalo Sabres G Ryan Miller hosted the third annual “Catwalk for Charity” fundraiser and cancer awareness last night in Buffalo. This year’s theme was “Speakeasy from the ’20s.” Sabres players and guests “showed off their flapper dresses, pinstripe suits and fedora hats” during the fashion show event. Miller started the event as a fundraiser for his charity, the Steadfast Foundation. NECN’s Stephen Iandoli reported from the 19th annual Boston Bruins Wives’ Charity Carnival this afternoon. The event benefits the Floating Hospital for Children at Tufts Medical Center. Bruins players signed autographs, took pictures for and played video games with fans. Iandoli: “And with the Bruins playing much better than in years past, the wives hope this year’s event is more profitable” (NECN, 1/4). Anaheim Ducks: The Anaheim Ducks partnered with local nonprofit, We Give Thanks Inc. and La Casa Garcia restaurant to host its annual complimentary We Give Thanks Thanksgiving dinner for local residents that might go without. Over the course of the day, more than 12,000 local residents enjoy a meal of traditional Thanksgiving fixings (Anaheim Ducks). Arizona Cardinals: The Arizona Cardinals took part in their annual “Help Feed The Hungry” Thanksgiving holiday dinner at Phoenix Rescue Mission on November 18 (Arizona Cardinals). Baltimore Ravens: The Baltimore Ravens and the Lady Ravens Association celebrated Thanksgiving with our variety of activities in the Baltimore community. In all, 15 players participated (Baltimore Ravens). Buffalo Bills: The Buffalo Bills served up a Thanksgiving dinner at the Northwest Buffalo Community Center on Tuesday night. Over 200 children and their families attended the 9th annual event (Buffalo Bills). Carolina Panthers: The Carolina Panthers served 200 steak dinners to homeless men at the Uptown Shelter in Charlotte on Tuesday afternoon (Carolina Panthers). Chicago Bulls: Chicago Bulls players Luol Deng, Tyrus Thomas and Aaron Gray shared Thanksgiving dinner with 843 visitors at a homeless shelter in Chicago earlier this month (Chicago Bulls). Cincinnati Bengals: The Cincinnati Bengals held their annual canned food drive prior to the Philadelphia Eagles game on November 16. Fans donated 7,630 pounds of non-perishable and canned goods. In addition, Bengals fans gave $8,020 in cash donations to help feed the hungry in our community (Cincinnati Bengals). Cleveland Cavaliers: The Cleveland Cavaliers, along with Feed the Children, provided 400 Cleveland children and families in need with boxes of food and personal care items on November 14 (Cleveland Cavaliers). Dallas Cowboys: Dallas Cowboys made a visit to The Salvation Army homeless shelter on Tuesday and served an early Thanksgiving dinner. The players and some of their wives and coaches’ wives passed out dinners to some 200 less fortunate people (Dallas Cowboys). Dallas Mavericks: The Dallas Mavericks hosted the 12th annual Turkey Dunk Thanksgiving Party on Monday. The event featured a basketball clinic, question-answer session with all Mavs players and coaches, and a four-course meal (Dallas Mavericks). Detroit Lions: Detroit Lions S Dwight Smith, a Detroit native, distributed turkeys, stuffing, gravy, dinner rolls, bacon, hot dogs, and Pepsi and Faygo products at Savon Foods Supermarket on November 25 (Detroit Lions). Golden State Warriors: The Golden State Warriors hosted their eighth Annual Holiday Meal Serving in Oakland on November 19. Warriors players, staff members and the Warrior Girls were on hand to distribute pre-packaged meals that included all the fixings for a complete Thanksgiving feast to 300 families from various Bay Area shelters and nonprofit organizations (Golden State Warriors). Houston Texans: The Lady Texans teamed with HEB to help raise money to feed families for the Thanksgiving holiday. The group presented a check for $5,697.00 after their first-ever Lady Texans Turkey Drive. The funds helped feed more than 350 Houston families that otherwise would not have had a meal this holiday season (Houston Texans). Jacksonville Jaguars: This year’s Operation Blessing, the Jacksonville Jaguars’ annual food distribution program held the Tuesday before Thanksgiving, assisted more than 3,000 Eastside families who are in need during this holiday season (Jacksonville Jaguars). Kansas City Chiefs: The Kansas City Chiefs continued their long-standing Thanksgiving outreach this time of year through eight seperate hunger-relief initiatives. One effort included Chiefs players and wives hosting the annual pot luck dinner for 60 families at the Ronald McDonald House (Kansas City Chiefs). Los Angeles Clippers: Los Angeles Clippers G Baron Davis and the Rising Stars of America Foundation donated Thanksgiving Dinner to 75 families on Sunday, November 23 (Los Angeles Clippers). Miami Dolphins: The Miami Dolphins contributed monetary donations to purchase more than 1,370 Thanksgiving meals to feed more than 14,000 underprivileged people in South Florida (Miami Dolphins). Minnesota Vikings: Minnesota Vikings G Steve Hutchinson and his wife, Landyn, hosted an early Thanksgiving meal for young patients and their families last Tuesday at the University of Minnesota Children’s Hospital, Fairview. It’s the third such dinner the Hutchinsons have hosted (Minnesota Vikings). New Jersey Nets: The New Jersy Nets served meals to more than 100 people in need at Montclair Citadel Salvation Army on November 17. The Nets also distributed food packages and frozen turkeys (John Shabe, Newark Star-Ledger, 11/18). New Orleans Hornets: New Orleans Hornets G Chris Paul and his older brother C.J. teamed up with Rouses Supermarkets to donate $50 gift cards to a total of 100 local families that can be used to purchase Thanksgiving meals. The Pauls came up with the idea to donate gift cards to 50 families, which was matched by Rouses (New Orleans Hornets). New Orleans Saints: New Orleans Saints RB Deuce McAllister and the Saintsations shared Thanksgiving by giving away complete turkey dinners to 100 families in the New Orleans area on Tuesday. McAllister and the Saintsations greeted 100 pre-selected families from four area non-profit organizations (New Orleans Saints). New York Jets: The New York Jets Women’s Organization visited The Community Soup Kitchen of Morristown, NJ, to donate and serve food as well as decorate the hall for the Thanksgiving season. The soup kitchen normally serves from 80 to 180 guests daily (New York Jets). Oklahoma City Thunder: As part of the Oklahoma City Thunder’s Holiday Assist Program, the team recently handed out Thanksgiving dinners to families. The program will reach thousands of Oklahoman children and families (Oklahoma Thunder). Phoenix Coyotes: The Phoenix Coyoted participated in the Big Guy Turkey Drive at the Salvation Army headquarters in Phoenix on Thursday. The effort provided Thanksgiving dinners to people throughout the Valley (Phoenix Coyotes). Pittsburgh Steelers: Pittsburgh Steelers WR Hines Ward teamed with the Salvation Army and opened up his South Side 86 restaurant to families from the Homeless Family Crisis Center and Homewood Brushton area that otherwise would have had meager meals this Thanksgiving (Pittsburgh Steelers). Sacramento Kings: Sacramento Kings players Francisco Garcia and Bobby Brown visited kids at WIND Youth Services and served a full Thanksgiving meal on November 15 (Sacramento Kings). San Francisco 49ers: The San Francisco 49ers in partnership with CityTeam Ministries, served Thanksgiving dinner for over 2,000 low-income citizens in San Jose on Tuesday. The players and volunteers worked in the distribution center and food kitchen to serve meals and hand out holiday food boxes and turkeys to the families who were looking for assistance (San Francisco 49ers). San Jose Sharks: The San Jose Sharks joined with the Jr. Sharks to host the 2nd Annual Frozen Turkey Drive in conjunction with Second Harvest Food Bank. Since July of this year, Second Harvest Food Bank has experienced a 55% increase in food requests (San Jose Sharks). Seattle Seahawks: Seattle Seahawks WR Nate Burleson hosted dozens of Seattle-area children from the Rotary Boys & Girls Club for his first annual Thanksgiving dinner. Burleson was joined by some of his Seahawks teammates (Seattle Seahawks). St. Louis Rams: For the 14th year, the St. Louis Rams on Tuesday passed out turkeys at three different locations to help feed over 1,600 families in the St. Louis community (St. Louis Rams). Tampa Bay Buccaneers: The Tampa Bay Buccaneers hosted its second-annual “Turkey Time with the O-Line” event last Tuesday, and about 600 families who filed through the parking lot of the Bucs’ training facility in their cars to receive a Thanksgiving meal (Tampa Bay Buccaneers). Washington Redskins: The Washington Redskins hosted its sixth annual “Harvest Feast” on Tuesday at FedExField, distributing Thanksgiving food baskets that included a whole turkey to Prince George’s County resident in need (Washington Redskins). Washington Wizards: The Washington Wizards held their 10th annual Turkey Drive at Heaven’s Grocery Store in Northeast Washington, DC on November 20. Wives of the Washington Wizards gave out 400 turkeys and bags of food to help feed those in need this Thanksgiving (Washington Wizards). The majority of this information was gathered from team Web sites. Please visit the Resources section for links to each team’s community relations program. The Wayne Gretzky Foundation will host a new Nationwide Tour event north of Toronto called the Ford Wayne Gretzky Classic beginning next June, according to Jon Show of the SportsBusiness Daily. Ford Motor Company of Canada will be the title sponsor and Samsung Electronics Canada is the presenting sponsor under three-year deals. The purse is $800,099 in a nod to Gretzky’s former No. 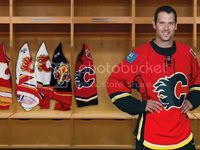 99 uniform. A source said that the event will be televised on Golf Channel (SportsBusiness Daily, 11/19). For more information on the Wayne Gretzky Foundation, please visit www.waynegretzky.com. The chapter recognizes, “Founded in 1993 by hockey legend Mario Lemieux shortly after his diagnosis and treatment for Hodgkin’s disease, the Mario Lemieux Foundation, based in Bridgeville, has donated millions of dollars to area institutions. A $5 million gift to the University of Pittsburgh Medical Center established the Mario Lemieux Center for Patient Care and Research in 2001, including a lab focusing on Hodgkin’s disease research. A $1 million gift just one year later established the position of Endowed Chair in Pediatric Oncology Research at Children’s Hospital of Pittsburgh. “Another initiative, the Austin’s Playroom Project, was created following Mario and his wife Nathalie’s personal experience while caring for their premature son at Magee-Womens Hospital. In just eight years enough funds have been raised to complete 11 playrooms with another seven scheduled to open in the coming months. “The Lemieux Family has experienced many personal challenges, but rather than leaving these experiences in the past, Mario and Nathalie have used them as a catalyst for public service, selflessly donating both time and money to help others” (Western Pennsylvania Chapter of the Association of Fundraising Professionals). 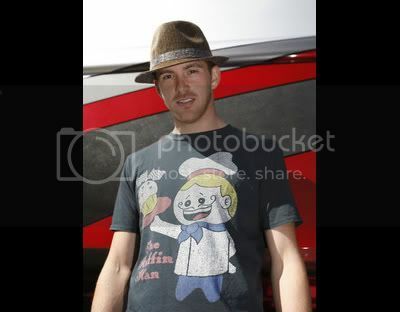 NASCAR Sprint Cup Series driver Scott Speed, who has been diagnosed with the digestive condition ulcerative colitis, is raising money for the Chron’s & Colitis Foundation of America (CCFA) by selling “Muffin Man” t-shirts, which he designed in partnership with Arizona-based Muze Clothing. The shirt sells for $40, with 100% of the proceeds from each sale being earmarked to benefit CCFA (Muze Clothing). In St. Louis: St. Louis Rams DT La’Roi Glover and his La’Roi Glover Foundation hosted 350 Missouri kids at the November 2nd Rams-Arizona Cardinals game. Following the game, the kids enjoyed a meet and greet with Glover. 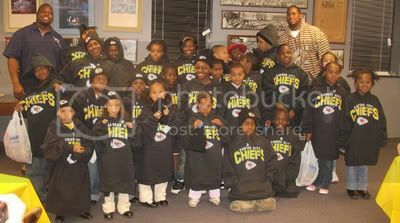 Kids were invited from the Herbert Hoover Boys and Girls Club and Big Brothers/Big Sisters of Eastern Missouri (Giving Back Fund). In New York: New York Giants LB Gerris Wilkinson, New York Jets S Abram Elam and retired NFL player Jack Brewer joined Genworth in New York last month to help revitalize the local Jackie Robinson Park. Wilkinson joined the volunteers in cleaning up trash and debris as well as planting new tulip bulbs in the garden area. Elam and Brewer shared their experiences with over 50 youth of the after-school program and flag football team (Athletes for Hope). In Cleveland: Olympic Gold Medalist Kerri Walsh donated two signed volleyballs to the MaryEllen Locher Foundation for their Volley for a Cure Fundraiser in conjunction with Homecoming at Lee University on November 6-7. The volleyballs were auctioned off during the “Pink Party” on Thursday November 6. On Friday, during Lee University’s Homecoming Volleyball game, all fans and teams are encouraged to wear pink in support of the cause (Athletes for Hope). Vogel writes that “as Gambacorta sees it, Buffalo has a long, storied history of hockey that it should boast about.” He “envisions his collection as the seed” for the museum. Vogel: “He’d like to see the museum downtown, maybe near the waterfront. He insists on a strictly local focus, and would like parts of the site to be interactive in order to draw families as well as sports buffs” (Buffalo News, 11/3).